NEW DELHI, Dec. 18 (Xinhua) -- Indian Prime Minister Narendra Modi's Bharatiya Janata Party (BJP) won the election in the western state of Gujarat, Modi's home state, sixth time in a row on Monday, and wrested Himachal Pradesh in north India from the main opposition Indian National Congress Party. While final results of the elections held earlier this month are yet to be officially announced by the Election Commission of India, the BJP is most likely to win nearly 100 seats in Gujarat out of the total 182, with the Congress finishing a close second winning 77 state constituencies. In Himachal Pradesh, the BJP is expected to win nearly 45 constituencies out of the total 68, while the Congress stands a distant second winning some 21 constituencies. Before becoming the prime minister in May 2014, Modi was the chief minister of Gujarat state for four consecutive terms. Almost all senior party leaders, including cabinet ministers, camped in Gujarat for almost a month involved in hectic campaigning. Hailing his party men for the victories, Modi tweeted: "I salute the BJP workers in these states for their hard-work which has led to these impressive victories." On the other hand, Congress party chief Rahul Gandhi conceded defeat by saying "the Congress party accepts the verdict of the people and congratulates the new governments in both states." Victory in both states is being directly attributed to the active campaign carried out under Modi's leadership, even as the BJP's state leaders hardly found any limelight through the electioneering process. This could be gauged from the fact that the BJP's chief ministerial candidate in Himachal Pradesh P.K. Dhumal himself lost his constituency. The year-ender elections results assume immense significance for the Congress as these are the first election results that came out after Gandhi was installed as the new president on Dec. 16. Gandhi, 47, has been into active politics since 2004 when he became a member of parliament for the first time. Gandhi, the sixth member of Nehru-Gandhi family to become the Congress president, has been struggling to make a mark in Indian politics, being pitted against Prime Minister Modi. 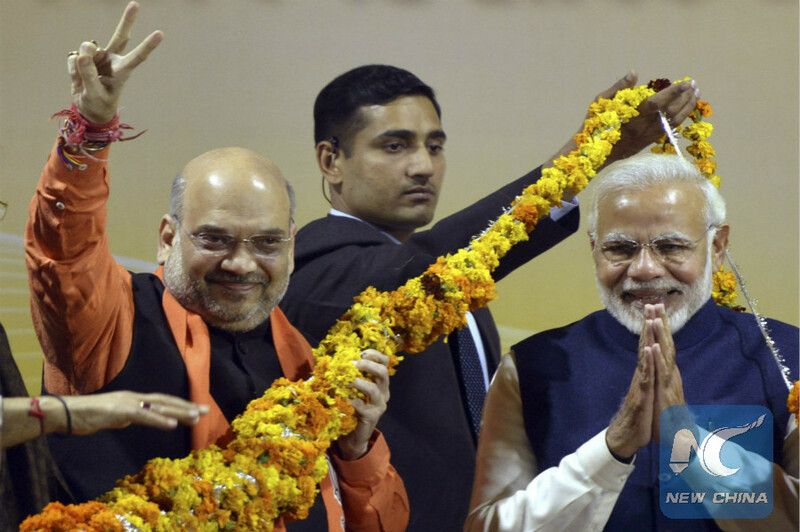 Modi's win in Gujarat and Himachal Pradesh is expected to have a positive effect in next year's polls in four big states, namely Karnataka, Madhya Pradesh, Chhattisgarh and Rajasthan. Karnataka is currently ruled by the Congress, while the other three states by BJP. Besides, three smaller states in northeast India, namely Meghalaya, Mizoram and Tripura are also scheduled to go to polls next year. Thereafter, India goes to general elections in early 2019. In the past three and a half years of Modi's rule, BJP lost elections only in three states and union territories, namely Delhi, Bihar and Puducherry. It managed to garner Bihar earlier this year by stitching an alliance with the state level party - the Janata Dal (United). Also earlier this year, the BJP suffered a humiliating defeat in northern state of Punjab, which is now ruled by the Congress party.